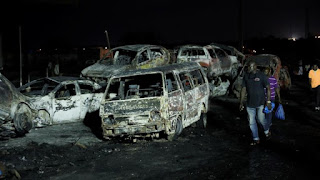 More than 50 vehicles burned in Lagos oil tanker explosion highlighting poor road safety conditions in the country. LAGOS (AL JAZEERA)--Calls for improved road and vehicle safety are increasing in Nigeria following the death of at least nine people when a petrol tanker with failed brakes crashed and exploded. The explosion took place at about 5:30pm (16:30 GMT) on Thursday on the Lagos-Ibadan expressway, one of the main routes out of the megacity, and destroyed at least 54 vehicles, according to authorities. "Unfortunately, nine bodies were confirmed dead and recovered from the scene (eight adults and a minor) and four persons sustained various degrees of injuries and were taken to the hospital," Adesina Tiamiyu, head of the Lagos State Emergency Management Agency (LASEMA), said in a statement. The stricken tanker in Thursday's crash was carrying 33,000 litres of petrol at the time. Bolarinwa Mufutau, a roadside mechanic, said he had just finished repairing a car when he saw the tanker rolling back on the road. "I could also hear the driver shouting 'brake failure, brake failure'. I saw the motor boy (assistant) trying to put a wedge to stop the tanker from rolling back," he told AFP news agency. The truck ran over the wedge backwards and immediately there was a bang. I thought it was a bomb and there was an explosion and fire everywhere, so I started running away." A fire erupted within seconds, forcing motorists to abandon their cars and flee, he added. The latest incident has raised concerns about safety practices on the country's roads. Petrol tanker fires are not uncommon on Nigeria's roads, which are often in disrepair and where vehicles are frequently old and poorly maintained. Blocks are often put behind the wheels of ageing, rusting trucks when they are stationary in traffic. Motorists caught up in the chaos have questioned why full tankers were allowed on the road during peak traffic periods. Chike Oti, Lagos state police spokesman, was quoted by local media as saying drivers of tankers and articulated trucks had been warned to "put in all necessary safety checks".